The Model-X push button station (PBS) is designed for use at a pedestrian crosswalk with in-pavement or overhead flashing yellow lights. 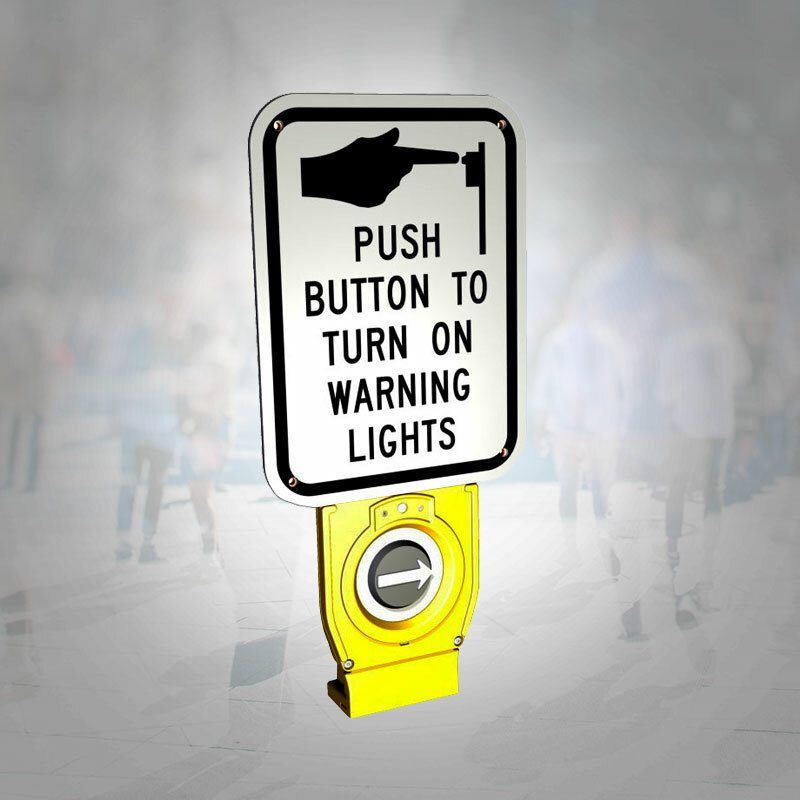 The Model-X push button station (PBS) is designed for use at a pedestrian crosswalk with in-pavement or overhead flashing yellow lights. Working in conjunction with a control unit, the Model-X provides an instructional sign, a push button with directional arrow for activating the flashing lights, a voice message, and a group of yellow LEDs which flash in sync with the street lighting. The Model-X uses the same rugged and reliable push button station and housing as Polara’s EZ COMM Navigator PBS. High-reliability, full-featured push button with raised directional arrow. Installs easily and operates using either a 120 VAC or DC powered Control Unit. Features a locating tone and voice-on-location message, with ambient sound compensation. In-unit LEDs are synchronized to crosswalk sign, in-pavement, or overhead lights. Full-featured station designed for use at pedestrian crosswalk with in-pavement or overhead flashing lights. Works in conjunction with multiple option control units. Provides instructional sign, push button with directional arrow for activating flashing lights, group of 3 LEDs which flash in sequence with crosswalk lighting, a locate tone (optional), and voice message. Same rugged, reliable push button and housing as Polara’s EZ COMM Navigator. Automatic volume adjustment to ambient sound level via noise monitoring microphone, 10watt RMS audio amplifier, and built-in speaker. The XAV2E-LED is supplied with an 8 position terminal block ready for connection to a Control Unit. Supplied with stainless steel mounting hardware and installation instructions. 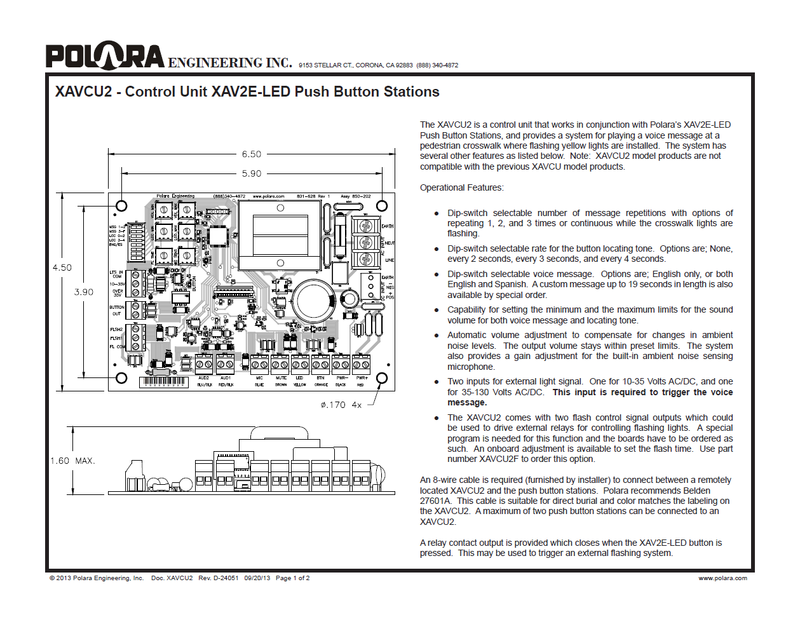 This is the specification/cut sheet for the Model XAV2E-LED Push Button Station. This is the specification/cut sheet for the 120 VAC powered Model X control board. 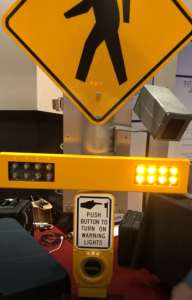 The XAVCU2 is a control unit that works in conjunction with Polara’s XAV2E-LED Push Button Stations, and provides a system for playing a voice message at a pedestrian crosswalk where flashing yellow lights are installed. 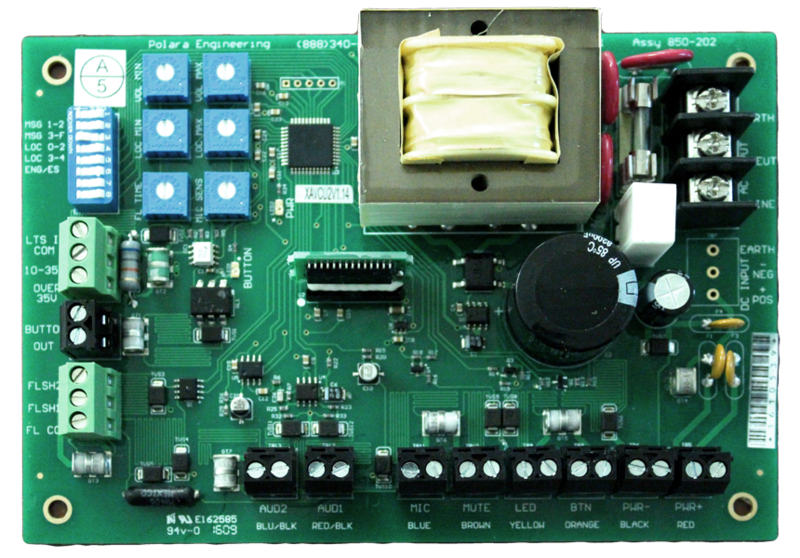 The XAVCU2 control board is powered by a 120 VAC supply. 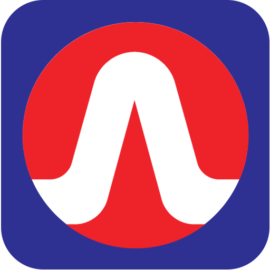 Part number for ordering is XAVCU2. Also available, is the XAVCU2F which provisions the control board with a flash control option via two normally open relays. 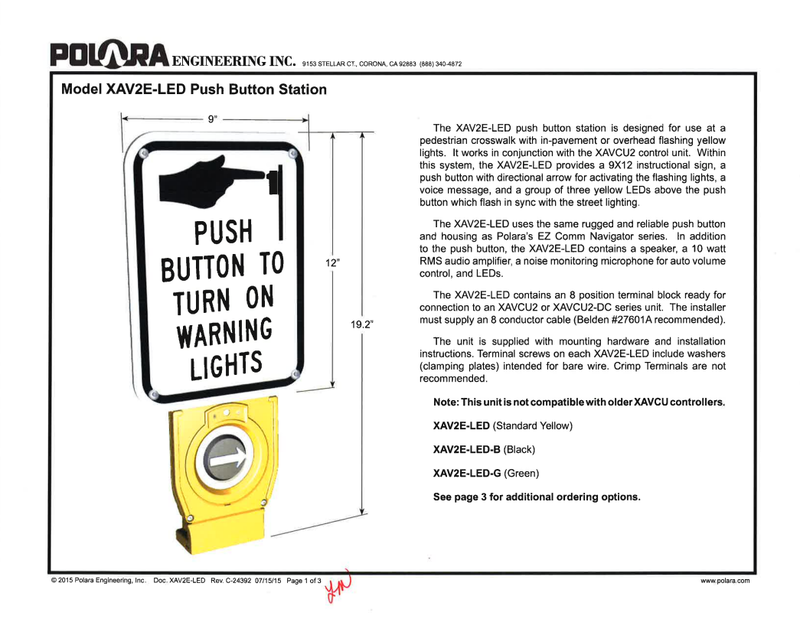 The XAVCU2-DC is a control unit that works in conjunction with Polara’s XAV2E-LED Push Button Stations, and provides a system for playing a voice message at a pedestrian crosswalk where flashing yellow lights are installed. 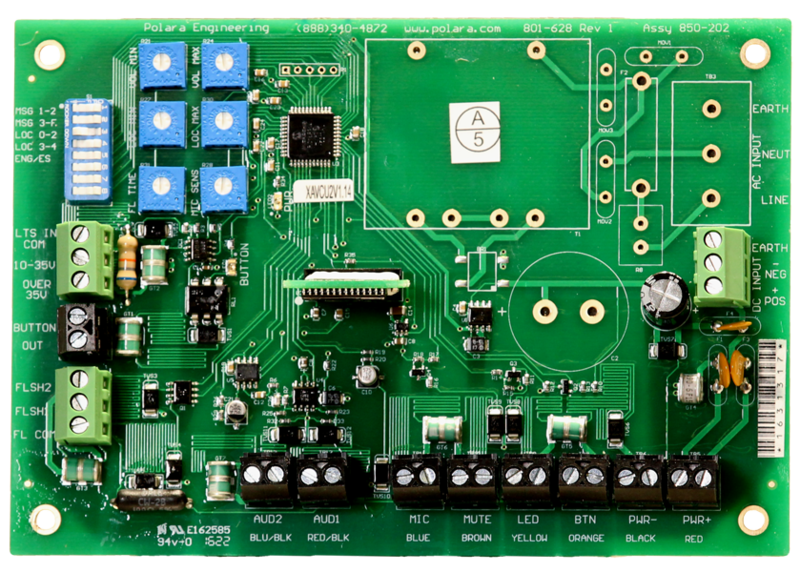 The XAVCU2-DC control board is powered by a 10 to 24 VDC supply allowing this unit to be powered directly from a battery for solar powered applications. Part number for ordering is XAVCU2-DC. Also available, is the XAVCU2F-DC which provisions the control board with a flash control option via two normally open relays. The Model X uses the same aluminum casting as the ENavigator (EN2 and EN4) so all of the hardware accessories under the EN2 Push Button Station will work with the Model X unless otherwise noted. Please visit EN2 Model Accessories section. 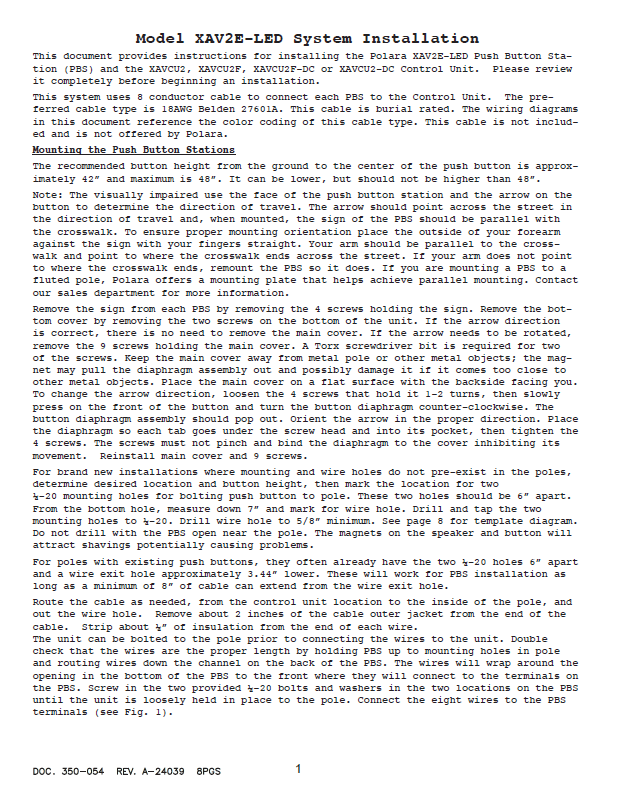 This is the complete manual on the Installation of a Model X Push Button Station.